When Sam & Marian Thomas decided to sell their farm to EGStoltzfus, it wasn’t a sad goodbye to the land that Marian called home, not only as a child but also through 30 years of marriage. For the homestead that Marian’s father purchased in 1952, it was the end of one chapter and the start of another – our Landis Farm neighborhood. The Thomases played a big part in the design & planning of Landis Farm. Then, they decided to build their new home at Landis Farm and became the first residents of the neighborhood. Sam & Marian’s custom home pays homage to the land’s history, with features like salvaged barn beams from one of the old homestead properties. “To be in a home filled with memories from the farm is a precious thing,” Marian says. 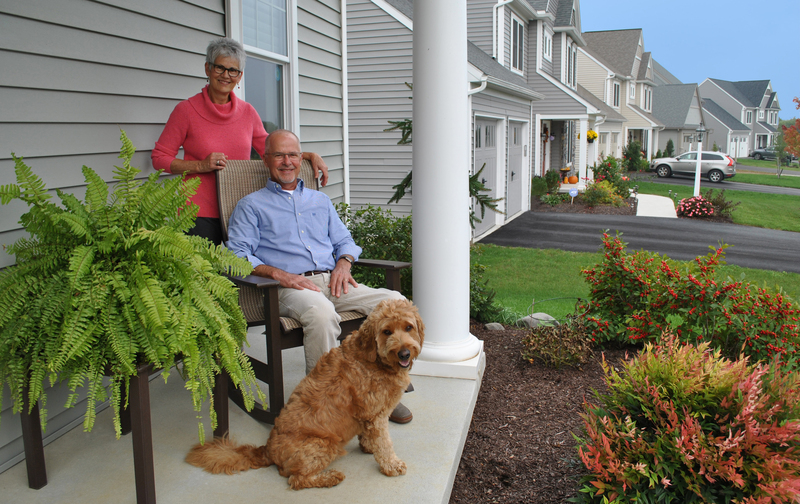 The Thomases have fully embraced their new home at Landis Farm – and their new neighborhood. Along with their Goldendoodle, Timmy, they have become the unofficial ambassadors of Landis Farm. Sam organized the purchase of a snowblower that’s shared among neighbors. And Marian is known to deliver homemade cinnamon buns to neighbors on snowy days. The Thomases also placed birdhouses along the green space and walking trail at Landis Farm. The sense of community has also grown to include a summer block party and winter holiday party. Just like the Thomases, each EGStoltzfus homeowner has their own history and special story. Contact our team today and see how we can help create a truly unique space where you can enjoy life’s moments and build your own tale – one story at a time!